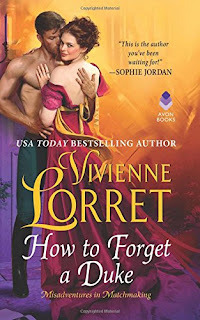 I read Vivienne Lorret’s How to Forget A Duke in a day. It was that good. It is most certainly a five star book. This is the first book of Vivienne Lorret’s newest series centering around The Bourne Matrimonial Agency, the Bourne sisters, their endearing uncle and a rather secretive Duke. The Bourne Matrimonial Agency acts as matchmakers to the ton. We learn early on that the Duke of Rydstrom and his secrets are no match for Jacinda Bourne the middle and meddlesome sister. He knew she was trouble when he found her in his library in the early morning hours dressed as a servant of all things! He thwarts her but Jacinda is not one to go quietly. She hatches a plan to go to his country seat to discover what else she can find about him. This one’s a firecracker! Off she goes and Rydstrom hot on her trail which unfortunately leads to the cliffs of his estate where he finds her washed upon the shores with a nasty gash on her head. Now he's stuck with her convalescing in his home. The upshot, such as it is, is that she has amnesia. He’s ready to pack her on her way once the gash heals, back to the bosom of her family whom she doesn’t recall. She doesn’t recall anything for that matter. A storm and the logic of the local doctor keeps her where she is because the shock of going home and being confronted with her family could be very damaging to her. Rydstrom tries his best to secret away his secrets and hopes Jacinda’s injuries with keep her discovering them in check. What he doesn’t count on is her inherent curiosity which drives her to discover who she is, who Rydstrom really is and just what is going on in his home. His structured, carefully controlled world is turned upside down. Once again, Vivienne has drawn me into the lives and love between two seemingly incompatible people. I ached for them to open themselves to each other and to be the balm they both need. Vivienne Lorret does just that in this book. I can’t wait to read the rest of the books in the series. I hope that everyone at the Bourne Matrimonial Agency, both clients and owners, find their happily ever afters, as well. I've not read her but it definitely sounds like something I would enjoy - thanks. I read it and enjoyed it as well! It sounds like there is humor......I love humor. Sounds like it will be an enjoyable read. Thanks for the review. This sounds delightful. Thank you for the review. I've read this and really enjoyed it. What could be more fun than a female Sherlock Holmes and a Duke who acts mysteriously.